LAS VEGAS (April, 2014) -- Skyline Exhibits, designer and producer of trade show exhibits, graphics and services, was named an exhibit design winner in Exhibitor magazine's first annual Portable/Modular Awards. Skyline's design for client Milliken & Company took the prize in the category of Best Island Exhibit Design Over 600 sq. ft. The competition honors excellence in portable, modular and system exhibits. It features 11 categories and is judged by an international panel of marketing and design experts. Jurors evaluate designs based on their aesthetics, functionality and innovation. Milliken, which owns a fleet of Skyline pop-up displays and tabletop banners for smaller shows, wanted a larger presence at their major industry show The International Plastics Showcase. The triennial show is the world's largest plastics trade show and conference. "Milliken struggled with purchasing a large exhibit when the show is every three years," says Tim Carter, exhibiting consultant with Skyline Exhibits & Design in Greensville, SC. "They wanted a structure that looked custom and professional, but they wanted to rent." 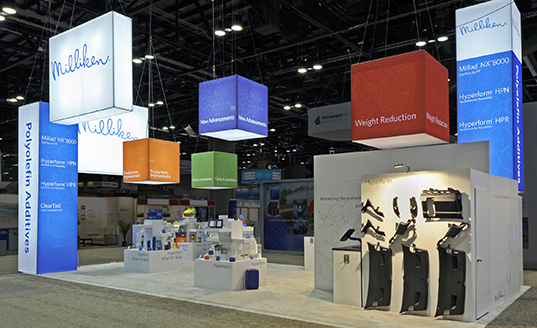 Skyline's design featured attention-grabbing backlit towers and hanging structures using one of Skyline's newer products, the modular PictureCube® Exhibit System. The design also included a semi-private meeting space and custom product display stands. While the custom graphics were purchased, the exhibit hardware was rented and fulfilled local to the show by Skyline's Service Center in Orlando. Exhibitor also honored Skyline with a Buyers Choice Award, which recognizes the best new exhibiting products. The winning entry was Skyline's revolutionary new product, the air-powered WindScape® Exhibit System.